Happy New Year! This is going to be an exciting hear I can feel it! 2016. Major change, major happiness. Simple. This blog which began as a place for me to chat about books and life easily moved into a cooking, life, lifestyle, and sometimes book place. I could reassess but I like how it is, how it's transformed. I talk about books a lot anyway and I use GoodReads to discuss. Sometimes books are part of a stream of what I'm already connecting to which makes them worth a discussion here. 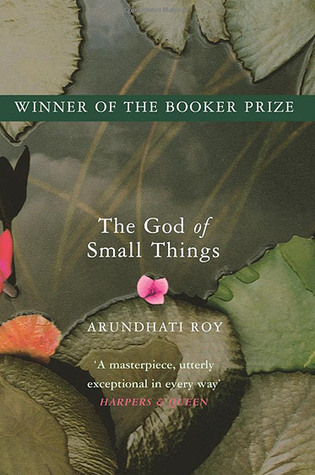 The God of Small Things by Arundhati Roy is worth it. I listened to a podcast about writing by an author I cannot recollect right now. My complaint about podcasts is that I listen to them while driving and can't write down a thing as a reminder. The host asked questions and the author spoke about becoming a writer, books she liked, authors she respected and I listened. At one point she brought up Roy's novel as a turning point for her as a reader/writer; a striking example of great writing. My ears perked up when I heard Roy's name and the title of the book; I've had that book languishing on my beautiful living room bookcase right next to the Barbara Kingsolver section. I don't know how the book came into my life; used book sale, friend, Barnes and Noble sale but it's been sitting there waiting for me. Winner of the Man Booker prize, published in 1997, it tells the story of twins Rahel and Esthappen and the season their cousin came to visit from England. The story, set in India, is interesting enough filled with unique characters that pull you in but the real winner of this story is Roy's language. She surprises you with ideas and word choices giving me new ideas for writing. I've got proof, parts that surprised and delighted me as I read. "Slowly the old boat sank, and settled on the sixth step. And a pair of two-egg twin hearts sank and settled on the step above the sixth. The image of fish giggling behind their fins strikes me as funny. It's a good image. "In his clean room in the dirty Ayemenem House, Estha (not old, not young) sat on his bed in the dark. He sat very straight. Shoulders squared. Hands in his lap. As though he was next in line for some sort of inspection. Or waiting to be arrested. The ironing was done. It sat in a neat pile on the ironing board. He had done Rahel's clothes as well. The short sentences. One thought. Quick. Descriptive sentences flow from them. The story is not linear and sometimes I don't know where I am the language and her captivating style keeps me reading. Have you read it? I would love to know your thoughts. May all my 2016 reading be just as thought-provoking.